As the smallest touch monitor from TVS, the PA80 impresses with its high performance, extremely flat design and small dimensions. With a screen size of 20.3 cm 8, the user has an LCD display at their fingertips with a resolution of 800x600 pixels in a shapely housing. 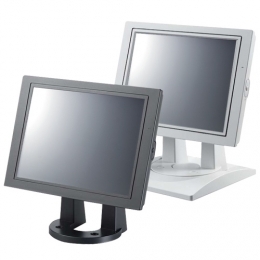 The touch screen stands out both in operation and display through its sophisticated performance a contrast rate of up to 5001 and brightness of 250cd/m make it an all-rounder at the POS station, as well as perfect compact display in production and in the office. The response time of 10/15 ms protects the users eyes, while the large viewing angle increases their efficiency. With up to 90 inclination, you can optionally use the monitor as a console device. The massive stand always guarantees secure support in every surrounding. Diverse set-up options, such as swivelable desktop mounting or the rear-sided VESA mount, give you the necessary flexibility to react professionally to different customer requirements. Stylish colour versions in white and black round out the presentation.